Info "Don't cut it too short." Beauty School is one of Kat and Ana's microgames in WarioWare: Twisted! 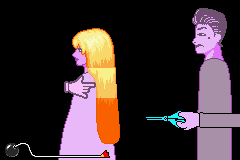 The player controls a hairdresser's hand. The game's purpose is to cut the woman's hair inside the yellow glowing part. To do so, the player has to press at the right timing. If done so, the game is won. If the player cuts below the glowing part, they won't lose, but they have to try again. If the player cuts above the glowing part, they lose. 1st level difficulty: The glowing part is large. 2nd level difficulty: The glowing part is halved in size from the first level. 3rd level difficulty: The glowing part is quartered in size from the first level. This page was last edited on October 29, 2018, at 21:25.